through the medieval towns of Grožnjan and Motovun, situated on hilltops which afford fantastic views. We will also visit the former Roman colonies of Poreč and Pula, which have kept impressive traces of the Roman Empire. Among the charms of culture and the beauty of nature, enjoy the richness of fl avors of local Istrian cuisine, excellent Istrian wines and olive oil. Arrival in Poreč. Info meeting with Fiore representative at 7pm at the hotel reception area where we will provide you with the package including hotel vouchers, bicycle with all equipment, maps and a road book. Overnight in Poreč. Our cycling tour of Istria will start with a ride from Poreč, the town where you can find material and spiritual evidences of great cultures at every step. Walk along the old city center and you will find there the Roman Forum, magnificent palaces from different historical periods, and to top it all, the famous Euphrasian Basilica (Euphrasiana). The ride along this trail starts from town of Poreč to its hinterland through villages of Mugeba, Fuškulin and Bačva where you can enjoy the breathtaking Mediterranean landscape with green vineyards and olive groves and taste home made food, wine, brandy and honey produced in this area. Continuing along the trail, you will reach Višnjan, a little place that vaunts an astronomical observatory ranked among the 5 most important observatories in the world. Passing by Mirna river delta and Novigrad you'll arrive to Umag. Continuing to northernmost point of Istria (Savudrija) and just before finishing first day you will do a one more cycle around Momjan area and finishing at Buje area. Breakfast, on the way to Buzet we will ride toward Brtonigla village from where are you going back to Buje and continuing a longer loop around Momjan and small Istrian villages around the area. In Marušići you will join on road towards Grožnjan – a typical istrian medieval town sprout high on top of the hill along the right coast of the river Mirna, vaunting its centenary walls, its renaissance loggia dating from 1585 and the beautiful St. Vitus and Modesto’s baroque church. If you just occasionally ride along its streets in which almost every door leads to art studios or galleries, and which windows from every direction echoes the sounds of different music genres, from classical to jazz, you’ll understand why Grožnjan is known as "The town of artists". Your day is leading you towards village Šterna – a village named after a big local cistern (on local dialect – Šterna) situated on the large plateau intersected by water flows. Oprtalj, with unchanged urban medieval disposition, the narrow streets, the shops, the beautiful Venetian palaces, portals and covered passages, and particularly the unique view to the Istrian peninsula from the town loggia, according to many the most beautiful of Istria. 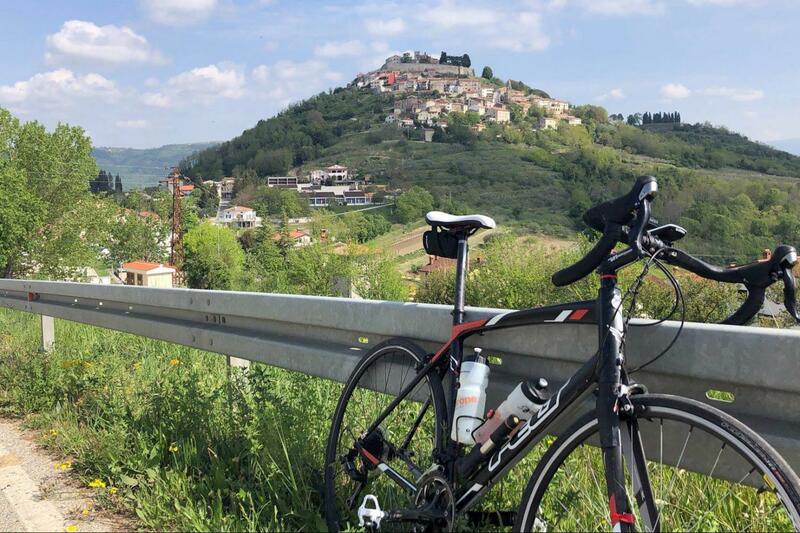 After Oprtalj and 5 km of downhill to village of Livade you will have option to go towards hilltop town Motovun. One of the most beautiful towns in central Istria will be real challenge for every road cyclist. After Motovun you will continue to Buzet, known as long as in the Roman times as Pinquentium, today is named as ’’the City of truffles’’, considering that the surrounding forests along the valley of the river Mirna cover some of the best areas of the entire Istria for the hunting of this divine tuberous. Overnight in Buzet. Points of interest: City of Buje, Grožnjan the city of artists, Livade the truffle center of the world, Istrian spa center, City of Buzet. Breakfast. After a taft climb to Prodani the road leads to one of the most attractive and picturesque istrian medieval towns – Draguć. The place which, until some hundred years ago lived from the cultivation of the silk-worm, today is almost completely abandoned. However, its unforgettable natural position and the exceptional beauty of the stone architecture, the modest palaces, the walls and the old churches, perhaps could seem somehow known. Considering that right here have been recorded numerous national and foreign production movies and TV series, like the movies "The 3 musketeers". Pazin – a true heart of Istria! First written records referring to the city as Castrum Pisinum appeared in 983 and presently, Pazin is known as a commercial, cultural and educational center of entire central Istria. Unique for its spectacular position above the carst abyssal cave, Pazin holds the medieval Castle – Kaštel (today, the Ethnographic Museum of Istria and the Municipal Museum are both in the castle) located on the verge of a 130 meters deep abyss. From Pazin you pass through Gračišće, an absolute pearl of the Istrian hinterland. The entrance into this town can be really enchanting: a magnificent Salomon Mansion made in the combination of gothic and renaissance styles, it makes you think for a moment as if you were lost in some distant corner of Venice. Continue further and turn right up to Šumber, were you are will have challenge on uphill. After Šumber you are riding in villages before town of Labin and arrive in Rabac, the pearl of the Kvarner bay. Overnight in Rabac. Points of interest: City of Draguć, Pazin the capital of central Istria, Gračišće, City of Labin, Rabac the pearl of east Istria. After breakfast you will have uphill warm up ride from Rabac to Labin. After reaching Labin old town you will continue ride across Skitača and other villages in Labin area from where you will have view on Kvarner islands. In Barban you can take break after another uphill. In Barban you are continuing towards Glavani village and Vodnjan. Vodnjan is famous because of very good quality of olive oil and family producers. Which city is situated on seven hills, has a magnificent Amphitheater and is not Rome? The answer is - Pula the largest city in Istria. Pula is an enchantress with thousand appearances which has been casting spell on its visitors for centuries. This day we finish visiting the old city with the Sergius' Triumphal Arch (from the end of the 1st century B.C. and the beginning of the 1st century A.D.) and famous Arena, a Roman amphitheater (from the 1st century B.C.). After reching Pula you will have oportunity to countiue towars Premantura for extra tour and back again to Pula. Overnight in Pula. After breakfast we ride towrdas Fažana situated in head of National park Brijuni islands. From Vodnjan you will continue towards Žminj and Svetvinčenat. Svetvinčenat, with its grandiose Morosini-Grimani citadel with towers, parish church, municipal loggia and a line of 16th century houses of the Renaissance and a town cistern - šterna in the middle, Svetvinčenat really belongs to a range of the most attractive Venetian creations of that period effected in this region, and with held one of the rare witchcraft trials in Istria during 17th century. You will head for the mysterious world of Bale region, proud for its glorious Soardo-Bembo Castle of the Gothic and Renaissance period and the parish church of St. Julian. Bale had been developed from the ancient Roman castrum (military fortification) along Via Flava, the ancient Roman road that used to connect Trieste and Pula. This day finishes in Rovinj. Points of interest:	Restaurants in Fažana, Castle in St.Vincent, Palaces in Bale, City of Rovinj. Breakfast. A marsh, rare birds, a cursed city, buried pirates treasure, a fjord, a cave with a primitive man and a hermit, an ancient solar observatory - all this you will find during today biking. Our bike ride will takes us across Kanfanar to small town of Žminj where we are turning left towards village Tinjan and Kringa. From Sveti Lovreč you will ride mostly downhill to beautiful fishermans town Vrsar from there continue to Poreč where your ride is finishing. You will ride across dry part of Lim channel. After riding along the coastline you will reach Vrsar, a romantic fishermen village where the famous Casanova came back even two times. 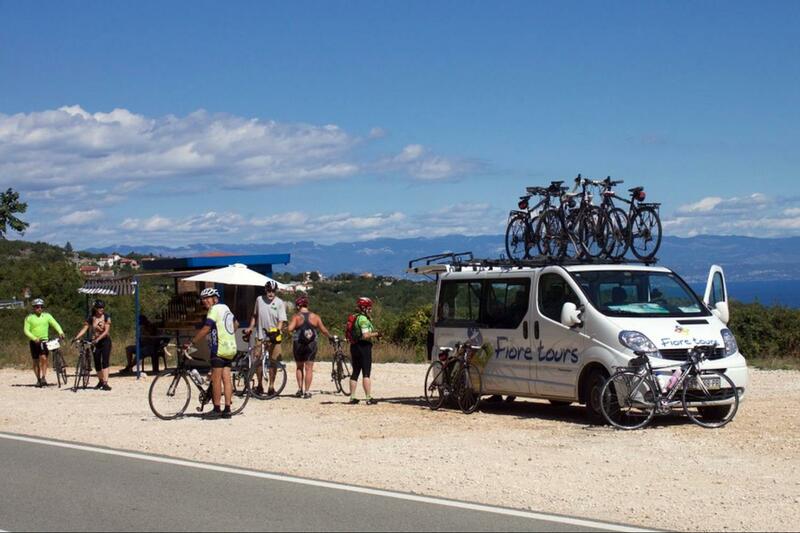 This one week bike tour finishes in Poreč where where you will spend the last night. Points of interest: Old city of Rovinj, Ruins of Dvigrad, Lim Bay, City of Vrsar, Poreč. You can take local bus froma airport to Pula bus station and from bus station to Poreč. The best is to take transfer. This route requires moderate degree of fitness. What type of bikes do you use? Our adult bicycles are quality hybrids, made by FELT. The model is the QX80 and we have a range of sizes to ensure there is a good match between you and your hire bike. These are very comfortable bikes, with quality components, ideally suited for roads and gravel tracks. The bikes have 27 gears, operated by easy-to-use gear shifters. How busy are the roads? The beauty of cycling in Istria is that the roads are generally very quiet. Our tours are planned on local roads with some short connections on main roads but generally the cycling is relaxed and traffic light. Traditionally April/May/June and September/October have always been the most popular time of year because the weather is better and on the road is less traffic. In July and August air temperature and humidity are higher and more traffic on the roads. What happens if I can’t cycle a stage? We use local taxis to transfer your baggage and they can normally move you, your bike and baggage to the next stop in case of emergency. Local buses can also sometimes take bikes. We discover Istria by the hand of Fiore Tours, Dalibor put everything together for us. Great bikes, good maps and the rolling hills of Porec and surroundings are what we need for our legs. We travel along wineyards, climb to all the villages and stop for a lunch at Novigrad by the sea.